Learn facts about the 16th president while creating a mosaic poster using his coined likeness. Put those pennies to good use! 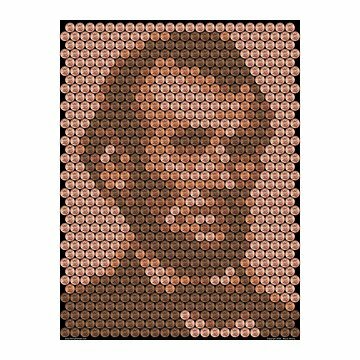 This poster set lets kids use the change they've collected over the years to create a copper-hued portrait of Abraham Lincoln. Instructions explain which penny patina variations go where and an educational booklet features facts about the 16th president and the history of the penny, along with scientific information like simple chemistry experiments using pennies and household materials. This kit is perfect for little history buffs, budding scientists, and coin collectors alike! Printed in Austin, Texas. Maury McCoy is a freelance graphic designer living in Austin, TX. His background is diverse including working as a 3D animator and video game producer. The inspiration for this product came from having a jar of pennies, a fondness for our 16th president and too much free time! Numerous attempts were made to create an image that is both easy to assemble and a convincing optical illusion. What started out as a simple proof of concept on the computer turned into something he was finally content with 38 versions later. Kit Includes: poster, instructions, educational booklet, and a commemorative penny. Glue and additional pennies not included. Fun gift. Great for a project. A penny portrait is not just a portrait, it's fine art! If I'm in need of the perfect unique gift, I know I can count on Uncommon Goods to have it. Grandson thought this was the greatest thing I could ever have gotten him. Was challenging but fun to do. I was very disappointed with this item. For the price of the item, the pennies should have come with it. It is misleading from the picture. It is a flimsy poster. A poster that I paid $24 plus. My husband is an avid coin collector. He enjoyed preparing the coins. The portrait was a rainy day project and it is hanging in his study. Vital to plan ahead, work from inside out and choose the right coins, as directed. Pennies do not want to stay put and the poster is very heavy once assembled. Having a hard time getting the pennies to stay on with simple school glue. Thought this product would be a little more durable, item said it came with an educational booklet features facts about the 16th president and the history of the penny, along with scientific information. Nothing but a poster was in the tube. No instructions just a poster. Purchased another item to give for Christmas. Includes a 1943 Steel Penny! It should be noted this kit also comes with a 1943 steel penny for the budding numismatist!